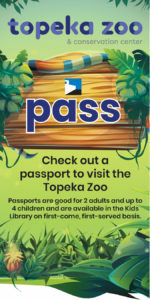 Customers can check out a passport to visit the Topeka Zoo & Conservation Center. The library has five total passports available. It is good for 2 adults and up to 4 children. Please present the pass upon arrival at the Zoo. Staff at the Zoo will keep the pass, which will be returned promptly to the library. Did you know that customers can check out a passport to visit the Kansas Children’s Discovery Center? This fun, hands-on children’s attraction emphasizes science, technology, engineering, art and math.